Upland, Indiana | November 19, 2010 | Scott A. Adams, DBA, Dean for the School of Business at Taylor University, has been recognized by Elite American Educators for his dedication, achievements, and leadership in higher education. An expert in finance management, Dr. Adams is responsible for overseeing department budgets, personnel review processes, program operations, professors and staff, teaching finance courses, and scheduling classes. Dr. Adams is also an advisor to Taylor University’s Student Managed Investment Funds (SMIF). With over 18 years of professional experience, Dr. Adams enjoys managing money and teaching students to manage their finances and money. Dr. Adams attributes his success to not giving up, his perseverance, attention to detail, and high standards of excellence. He feels that his greatest strength is the practical experience he earned while working at Merrill Lynch from 1997 to 2000 and his ongoing practice in finance and wealth management. In May of 2008 Dr. Adams was fortunate enough to have the opportunity to travel with a mission organization trying to teach entrepreneurial skills to indigenous people in Africa, over a three week period. He earned his Doctor of Business Administration from Anderson University in 2005. He retains affiliations with the Financial Education Association and the Financial Management Association International. In his spare time he lends his expertise to Hanfield United Methodist Church as a volunteer, which includes regularly playing piano. 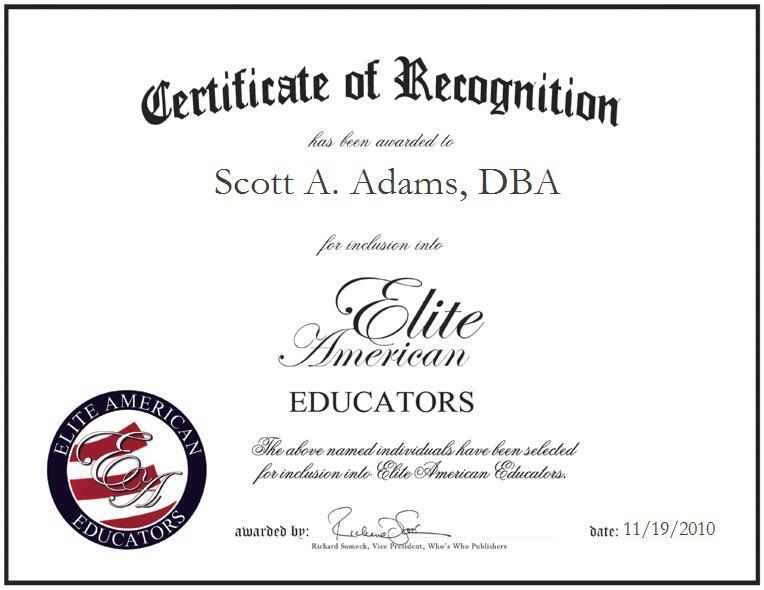 For more information on Dr. Scott A. Adams, please visit his personal website at http://www.scottadamsdba.com. Currently, Dr. Adams looks to the future and is excited about the opportunity of having an article, “John Wesley and the Goal of Maximizing Shareholder Wealth”, published in the Spring 2011 Issue of Christian Business Academy Review.